The circular saw is a handy tool for cutting dimensional lumber and ripping plywood. The saw features cut indicators to improve accuracy, a 5,000 rpm motor, and an easy adjustment bevel table for bevel cuts between 0-45 degrees. It comes with a standard 24 tooth blade, but accepts standard 7 1/4" blades for fine finishing work. 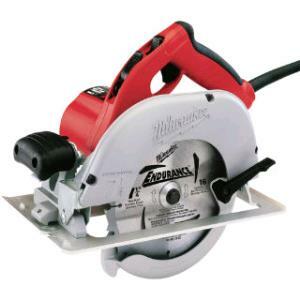 * Please call us for any questions on our circular saw 7 1/4 inch rentals in Hillsdale and Ridgewood NJ.